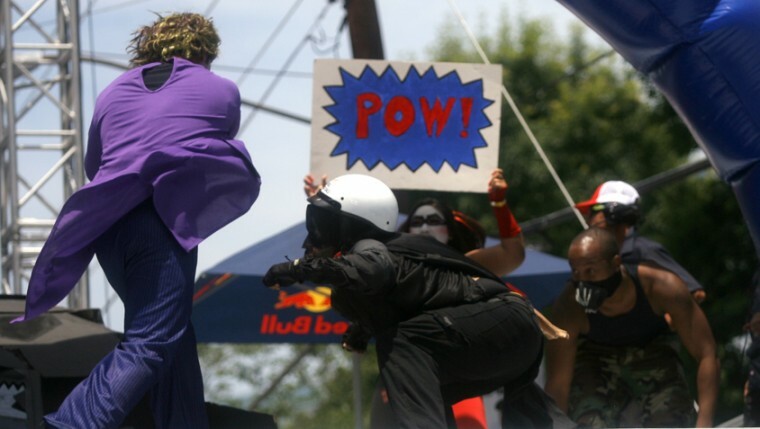 Home PERSONAL Red Bull Soap Box Race Results, Vid & Pics! Thank you to everyone for the support for my friends and I in the Red Bull Soap Box Race. We got third place for fan favorite! I just had to show you some of the awesome pictures from the event and I also plan on having a few more fun posts featuring the costume makeup (batman themed) I did! As you may have heard me, we did a Batman theme. The new Dark Night Rises movie comes out soon so we thought it would be perfect timing. Also, who doesn't love Batman? Check out our quick video skit! 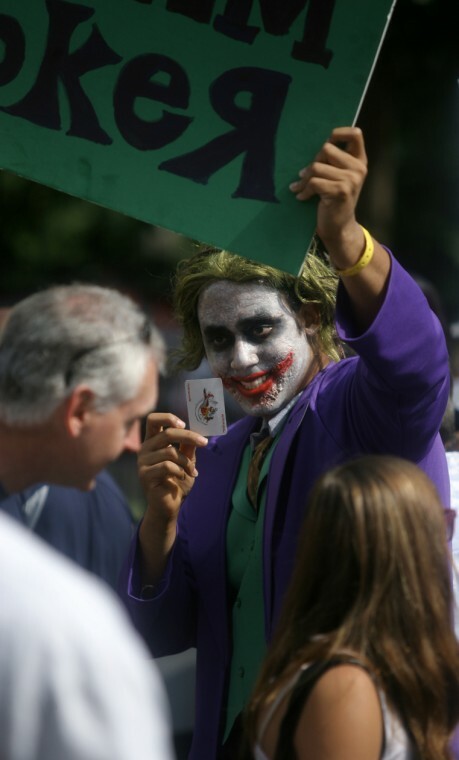 Here is the BF made up as Joker. He was a celebrity that day! This is a great a shot of our skit. Check me in the back carrying the POW! sign. I helped choreograph this fight scene! Check out the Tumbler, aka the Batmobile the guys built. The idea was that we were Team Joker who stole the Tumbler and we planned on blowing it up. Batman dressed up as goon, but later unveiled himself during our fight scene skit and saved the day! The big was surprise was that this batpod bursted out of the car on the stage...just like in the last movie when Batman crashed his car, but was able to still wheel out on his motorbike. Batman always has a back-up. The crowd loved it! Too bad our vehicle broke after coming down the second jump, lol. But who doesn't love to watch a crash? In fact, we won best crash! Our driver was a trooper and dragged the bike to the finish line! All in all, it was an amazing day. Can't wait to do it again! Stay tuned for some makeup posts featuring the character makeup I did for the event!